The Twilight Zone is filled with wonderfully terrifying stories, all of which provide terrific fodder for The Hollywood Tower Hotel as a marquee destination for the Twilight Zone. While the stories from the Twilight Zone prove that there is a vast array of manners in which an individual or group could enter into the Twilight Zone, with all of the remnants from these tales scattered about the Hollywood Tower Hotel, it would seem that the Tower of Terror is actually the epicenter of passage between our world and the Twilight Zone. One such story that has found its way into our world is that of The Dummy. Throughout the chronicle of The Dummy, originally airing in May of 1962, viewers are continually asked the question as to who the master is and who is, in fact, the Dummy. Ventriloquist Jerry Etherson is continually tormented by his wooden counterpart Willie. While the episode has been in the public consciousness for almost fifty years now, that is as much of the story as I dare divulge, for fear of a visit from Willie himself. Why would I tremble at the idea of a wooden man from another realm visiting me? Well, as it turns out he isn’t as far away as you think. 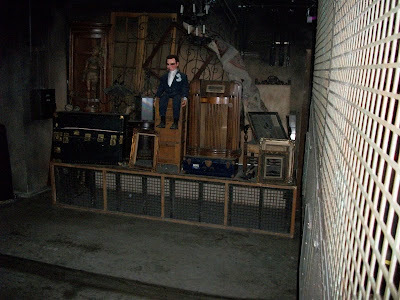 After taking a trip through the Hollywood Tower Hotel, and its slingshot into the Twilight Zone known as the Tower of Terror, those guests who have made it back through the barrier are deposited in the hotel’s basement. There, in one of the darker corners, sits a ventriloquist’s chest and, as guests’ luck would have it, Willie. He doesn’t speak as much as he did in 1962, but that doesn’t mean he isn’t just as malicious. Yeesh. That gives me the creeps! Wow, I had no idea that was there! Next time I ride ToT I'll be on the lookout for it before I head for another attraction. I love the history and creepiness found in the Hollywood Tower Hotel, it is the perfect mesh. I was just scrolling through some of the older posts that I have missed when I came across this. My sister became real close to a TOT cast member when she was doing her CP and the cast members were actually told the dummy was not Willie, but Caeser from another Twilight Zone episode. I'm not really sure which it is or if it is the same dummy in both episodes with a different name, but I thought I would just give you a heads up on this one.